FEATURED ARTICLE: Artificial Grass Sure Is Easy, But Is It Green? You might have walked past this Rio Vista home without realizing the lawn is artificial. Do you have a neighbor whose lawn always looks perfect? You never see him out front pulling weeds, and you can’t remember the last time your morning coffee was interrupted by his noisy yard crew. Look closely: It might be artificial grass. Some residents who have become frustrated by the challenges of natural grass have turned to artificial grass as a solution to their lawn-care woes. Made from authentic-looking shades of green polyethylene, artificial grass looks and feels far better than it’s unattractive predecessor, Astroturf. Environmentally conscious homeowners might question the idea of replacing natural grass with plastic, but artificial grass advocates argue that natural grass is not the “greenest” option. In fact, a high-quality, meticulously installed artificial lawn can have quite a few environmental benefits. It also provides homeowners who struggle to keep their lawns looking good a solution that is low-maintenance and long lasting. “It’s really about providing clients with a solution to a lawn that has never looked great,” agreed David Sheffer, president of Sarasota, FL-based AlternaScapes. Sheffer added that homeowners who have pets and children also benefit from the durability and pesticide-free nature of artificial grass. The only maintenance associated with artificial grass is the removal of leaves or other debris. This can be done with a push broom. Customers who invest in a high-quality product and installation, according to Sheffer, do not need to worry about drainage from rain or pet waste. Rainwater drains at a very fast rate of about 300 inches per hour. Potential clients often ask Sheffer if artificial grass is “green.” His response is that an artificial grass installation is worth up to 18 LEED (Leadership in Energy and Environmental Design) credits for developers. LEED credits incentivize builders and architects to use environmentally conscious designs and building materials. “Plus,” Sheffer added, “Every time you use a lawn mower, it’s spewing out more pollutants than 10 cars combined.” There is also the issue of watering, which must be kept up even in times of drought. Furthermore the synthetic fertilizers, pesticides and herbicides that many lawns are saturated with can negate the positive effect of having a lawn in the first place. However, environmentalists caution that artificial grass does not offer a completely green solution. Critics of artificial grass remind would-be customers about the hazards associated with all plastics, especially with its inevitable disposal. An article by Brandon Koerner on Slate.com points out that “artificial turf is typically landfilled rather than recycled.” Dettor concedes that much of the used turf does wind up in landfills. But he also explained that his manufacturer, Forever Lawn, is working with landfill sites to reuse old turf as a lining and a means of preventing erosion. Lindsay Barton from MomsTeam.com cites some of the health concerns associated with artificial athletic fields, many of which would be true for residential use as well. Another drawback to artificial grass is its temperature: natural grass is cooler than artificial. The Forever Lawn website (www.foreverlawn.com) states, “artificial grass does not stay as cool as natural grass because natural grass has water running through it, but it does not absorb heat like pavement, rock or brick.” While Koerner agrees that natural grass can be environmentally unfriendly because of its maintenance, he reminds readers of the carbon benefit of natural grass, and also the option that homeowners have of using organic fertilizers and a push mower in lieu of a gas-powered model. A third option that might be the “greenest” one of all is a xeriscape. A xeriscaped lawn replaces grass with ground cover and landscaping that minimizes the use of water and fertilizers. 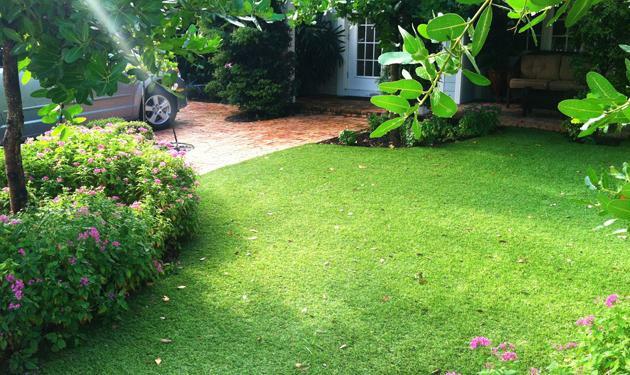 An additional consideration is the cost of an artificial lawn. Dettor estimates a price tag between $8 and $12 per square foot, including sod removal and installation. Lawns in Fort Lauderdale come in different sizes, but a modest three-bedroom home that spends about $150 on lawn care each month might have 3,000 square feet of natural grass. That’s an upfront investment of at least $24,000. However, it’s an investment that can last 15 to 25 years in some cases. Large hardware retailers offer a do-it-yourself option that runs closer to $3 to $5 per square foot for the turf, but Dettor feels that a proper installation and the use of a nailer board and screening sand is an important component of artificial grass’s longevity. Another way some clients reduce costs is to install artificial grass in parts of their lawn where sod won’t grow, while maintaining natural grass in other areas. An existing investment in landscaped beds and sprinklers can be incorporated into an artificial grass design. When it comes to money, Sheffer emphasized that most of his residential clients do not come to him with green lawns looking to spend less by converting to artificial grass. “They come to us when what they’ve been spending isn’t working and their grass is dead.” he explained. Many people still think of AstroTurf when they think of artificial grass, but the material has evolved from the rock-hard athletic fields of the 1970s. Sheffor credits a 100 percent polyethylene product as being softer and more natural feeling, while today’s manufacturing techniques have been refined to create a thinner and more irregular blade. Many parks and athletic fields have been using artificial turf successfully for years, so the extension into residential use has been logical. Sheffer said that his business has grown steadily by 20 percent each year for the past five years in spite of the economy, and Dettor agrees that his company has seen an increase in residential installations as well.